If you want to know why Mitsubishi remains a major player in Australia despite being an also-ran in other markets, it helps to look at the company’s history here. There are arguably four car lines that have buttressed the brand in Australia: the Triton pickup, Pajero (Montero) SUV, the Lancer and the Magna. While the Magna is long gone, for almost 20 years it was an integral part of the lineup and was one of the biggest threats to the Ford Falcon and Holden Commodore. The first Magna showed Mitsubishi had its finger on the pulse of what Australian car buyers wanted and was one of the few times Mitsubishi has ever outmanoeuvred Toyota. In one fell swoop, Mitsubishi created a new segment and made the stodgy, rear-wheel-drive Toyota Corona and Nissan Bluebird look like the relics they were. While in the European and North American markets the Japanese automakers had embraced front-wheel-drive, in Australia the traditional, conservative Corona and Bluebird ruled. The Camry launched in 1983 but only as a highly-specified, imported liftback; the new FWD Stanza and Bluebird sold elsewhere was a no-show. Mitsubishi could have continued plodding along with the thematically similar Sigma – and it did sell a reduced model range until 1987, mostly to fleets – but the company took a risk and developed the Magna exclusively for the Australian market. 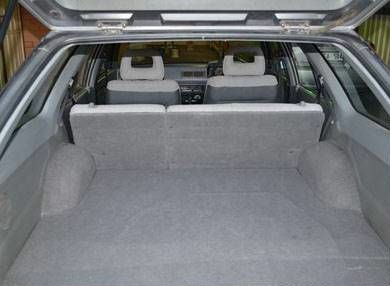 The design brief was to build a spacious sedan and wagon wide enough to seat three adults comfortably in the back seat. The new car had to have improved performance and fuel economy and thus couldn’t be heavier than the Sigma. It had to be more comfortable yet reliable and easy to service and offer at least comparable towing ability. The 1985 Magna was not entirely clean-sheet but instead was an extensive re-engineering of the 1983 FWD Galant, Mitsubishi engineers having decided in 1982 to work with the new Galant as a base for the Magna. Total development cost was $AUD 139 million. However, the new Galant’s width – like most Japanese cars – was limited by Japanese tax constraints to under 67 inches. The aforementioned requirement of being able to seat three abreast was what ultimately led to engineers stretching the body to create an additional 2.6 inches in width. Almost every panel was changed and the interior redesigned, although the Magna still clearly resembled the Galant. Plans for a 2.0 four-cylinder base engine were shelved, and instead engineers worked hard to ensure the Sigma’s carryover Astron 2.6 four-cylinder performed smoothly, fitting it with hydraulic mounts and balance shafts. Toyota and Nissan were no doubt floored when the Magna launched and immediately won accolades including the prestigious Wheels Car of the Year trophy in 1986. While they were developing FWD replacements to their stodgy mid-size models, they weren’t as spacious as the wide-bodied Magna. It took until 1992 for Toyota to offer a wider family sedan/wagon and beleaguered Nissan never bothered. Initially, the Magna was offered only as a sedan in well-equipped GLX, better-equipped SE and truly plush Elite trim levels. Several months after the TM Magna’s launch, the range was expanded with this handsome, Audi-esque wagon and a fleet-oriented Executive trim. Regardless of trim, all Magnas came with four-wheel disc brakes. Transmissions were a five-speed manual or a four-speed automatic with electronic control and overdrive, and the 2.6 Astron four produced 114 hp and 146 ft-lbs. The wagon was commendably practical, offering more cargo capacity and a larger payload than even the Commodore while matching the larger Falcon in unbraked trailer towing capacity. Rear suspension design was different to the sedan with a tubular beam and multi-link control arms and no anti-roll bar. However, the wagon offered upgraded rear disc brakes and other mechanical tweaks. Total cost of developing the wagon came to $AUD 38 million. To drive, the Magna could hardly be called exciting. It didn’t matter. Handling was competent, the ride was compliant, the engine was sufficiently powerful. In some dimensions, the Magna was actually more spacious than the Commodore and the cabin was certainly a more comfortable place to sit than the Japanese rivals. For fleet and private buyers fine with a four-cylinder, the spacious Magna hit the market sweet spot. Pricing undercut the big Aussie sixes by around $500, while costing only a grand more than the entry-level models of the hoary old Corona and Bluebird. Of the FWD Japanese cars, the Ford Telstar (a rebadged Mazda 626) started a few hundred dollars less but offered less room, an older design and no wagon; the imported Camry was a whopping $6,000 more. Although handicapped by being four-cylinder only, however acceptable the Astron 2.6’s performance was, the Magna was a great sales success. While it didn’t best the Falcon and Commodore, it regularly outsold the new 1987 Camry. Nissan had attempted to simultaneously hit the four-cylinder Japanese sedans/wagons and big Aussie sixes head on with its narrower, RWD Pintara and Skyline. However, even combined their sales couldn’t beat the four-cylinder Magna. Toyota eventually introduced a V6 Camry in 1988. The take rate of the V6 wasn’t large as it was offered only in an imported, highly-specified sedan variant. However, it showed Toyota was getting serious about making the Camry a player and the V6 was much smoother and yet simultaneously more efficient than the Mitsubishi four. Toyota’s V6 Camry was that range’s most prestigious model, and the fanciest Magna Mitsubishi had to offer was the Elite. This trim level offered distinctive alloy wheels, two-tone paint and plush velour trim, as well as (then novel) steering-wheel mounted audio controls and digital instrumentation. Power windows and central locking were also included. There were initial teething problems with the TM and TN Magnas, chiefly reliability issues with the automatic transmission and fragile engine heads. The TN saw the introduction of fuel injection to the Astron four in some trim levels – boosting power and torque by 13 hp and 7 ft-lbs — and the introduction of the featured Elite wagon, as well as some minor visual tweaks like redesigned taillights for the sedan. The transmission issues were resolved with the 1989 TP revision which again had some other minor visual and specification tweaks. Across the Pacific Ocean in New Zealand, Mitsubishi was offering the Australian-built Magna wagon and a New Zealand-assembled version of the Japanese market Galant Duke V3000 known as the V3000. This was a rather curious arrangement as if you wanted more power you had to deal with a smaller interior, however the V3000 was popular especially with police departments. Alas, the Australian market did without a V6 sedan until the next-generation Magna. Although the Magna was ageing by the turn of the decade, it still sold exceptionally well and had no rivals comparable in dimensions. But although the Camry was smaller, it was more modern both visually and mechanically: the Toyota had independent suspension all-round, while the Magna used a torsion beam axle rear with trailing arms. To keep the Magna fresh, Mitsubishi offered more distinctive trim levels such as the sporty Elante sedan and Grand Tourer wagon, both of which featured a firmer suspension tune and some visual tweaks. For 1991, Mitsubishi cleverly repurposed the near-luxury Sigma/Diamante sedan as a Magna replacement. Badged as Magna and Verada, the new TR-series was sized comparably to the similarly upsized 1992 Camry. The range opened with an Astron-powered, fleet special GLX, rising through four-cylinder and V6 models up to the range-topping Verada Xi. Again, Mitsubishi Motors Australia engineered a wagon variant that was actually exported to North America and Europe among other markets, and this launched in 1992 with the TP wagon being sold aside the new TR sedan for a year. The first-generation Magna was a thoughtful development from Mitsubishi, with the company investing a significant amount of money in engineering a new model sold only in two relatively small markets. Although spending this money was a gamble, it paid off for Mitsubishi as the Magna became one of Australia’s best-selling cars and a critical success. Although the Magna was axed in 2004 and Mitsubishi Australia no longer sells a passenger car larger than the Lancer, the Magna helped establish Mitsubishi as a bonafide player in the Australian market. In the USA, this was known as the Galant from 1985-87 with a 2.4L 4 cylinder and mostly 4 spd automatics, though I seem to remember seeing a few 5 spds @ the local Mitsu dealer. No wagon was ever offered. A friend owned one for ~ 5 years until the transmission started to have issues. The one interesting feature was the reclining rear seat. This car was a bit step up for Mitsu from the old Tredia sedan which was still being sold at that time. The Galant may have been I4 only from ’85 to ’87, but for ’88 and ’89, the older body Galant was sold with a V6 as the Sigma in the US market. I still own a Sigma Canso (When Mitsubishi sold the Magnas in Canada for a time as either the Sigma Canso or Dodge Parthenos GX) and those cars were Canada-ready!! my Galant Sigma was stylin’ and was light years ahead of the Pontiac-Opel-Buick offerings from GM Canada, and Cheaper than a Continental S (their main competition) Swiftier than them, and was roomy to boot! I still want one, that is, if I can find another Diamante wagon, they’re HOT! Sigma Canso? Dodge Parthenos? I’ve never heard of these… Can you provide some more info? Also, who made this “Continental S” you speak of? I like the sedans, but the blue wagon pictured looks like a poor re-engineered sedan. Oddly, the 2nd generation(?) wagon seemed pretty interesting with it’s standard (?) V6 at a time when Honda’s Accord wagon was 4 cylinder only and Toyota’s Camry wagon made you pay extra for a V6. I even considered one of those wagons until I heard how dismal the build quality was….even compared to other Mitsubishi products. Mitsubishi has had many interesting cars in the last 30 years, but they are hit and miss (except for the EVOs, they rarely produce a car better than the preceding generation of that model) and their marketing is bordering on perverse. Cars are introduced and 2 years later withdrawn from the market. Yeah Mitzis have always been a bit hit and miss. Their Outlander CUV is something of an exception – they’ve churned out over a million of them. The Outlander PHEV is doing very well. When I first saw the lead picture, I thought “Wow, a Renault Medallion!” To me, this Magna really does look like a Medallion — looking almost artificially stretched, in a (in my opinion) practical and attractive manner. Oddly, the sedan versions of the two cars don’t look that much alike — just the wagons. I’m somewhat familiar with the Galant sedans from when they were sold in the US, but never knew there was a wagon version. +1 Totally looks like a Medallion. That was also my first thought. Yeah initially these sold well untill the short comings were revealed the biodegradable auto box being the first nail in the coffin roofs rusting out at all four pillars was another and engine blocks cracking on the Astron, not particularly good cars they are however a nice drive on a level ofthe other local offerings, Aus was unusual in still having RWD Datsun Bluebirds and Coronas the NZ market had the more modern FWD versions of those cars plus the V2000 and V3000 Mitsus, The Police avoided them like the plague the MOT used them as highway patrol cars but those two departments were yet to merge back then and had different purchasing criteria. The V2000 wasn’t sold new here, it only arrived as a used import. We only got the sedan, haven’t seen one in years. Great read, William. It’s interesting – a 2.6″ widening from the Galant could have had a disastrous effect on this car’s proportions, but I like the Magna’s looks at least as much as the Galant’s. It’s great to read about something Mitsubishi did really right when they were a bigger player. The widening occurred when the previous model Tredia was stretched into the bigger Galant that was restyled as the Magna, its still built on the Galant platform but with Australian built engines. Oh, cool. Thanks for the pointer, Bryce. Maybe I should have read more carefully! Re engineered in Australia is often mistaken by Australians for being all Aussie design something their car industry has promoted since the FJ Holden. Some models of Magna like the 4WD version actually used an imported Japanese platform and all the panels fitted, having all versions in NZ unlike everywhere else makes it simple to realise they are the same car. Most of the Australian engineering centred around fitting an Astron four. Be nice KB. Wasn’t the car widened and had all new panels? No the Magna (1760mm) is wider than the Galant (1695mm), the Mitsubishi chassis codes are YF for the Galant and YFW (wide) for the Magna. The later Magnas were based on the Mitsubishi Diamante that was wider to start with. Friends of ours had a late-80s Magna wagon, I don’t remember exactly which model or year. Happily theirs was the 5 speed manual, so no auto trans troubles. I remember it was very quiet and smooth inside and had good space in the rear seat for 3 teenagers if not as much as a Falcon, although the middle passenger obviously didn’t get the transmission tunnel. The cargo area while not huge probably had more floor area than a lot of modern wagons that seem to box in the space on either side of the opening around the wheel arches for whatever reason. They weren’t a terribly inspiring car with dowdy if inoffensive styling and a decent performance-economy mix but no power options at this stage. Then you had the perpetual Mitsubishi problem of valve guide wear or whatever it is that causes them to blow blue oil smoke. We had an ’89 base trim manual sedan, with the optional injected engine and power steering. It was a great car, far superior to anything else we found at the price. It had plenty of space for a young family, a beautifully smooth ride, good enough handling for anything we threw at it; just could have done with more power. Excellent article William! 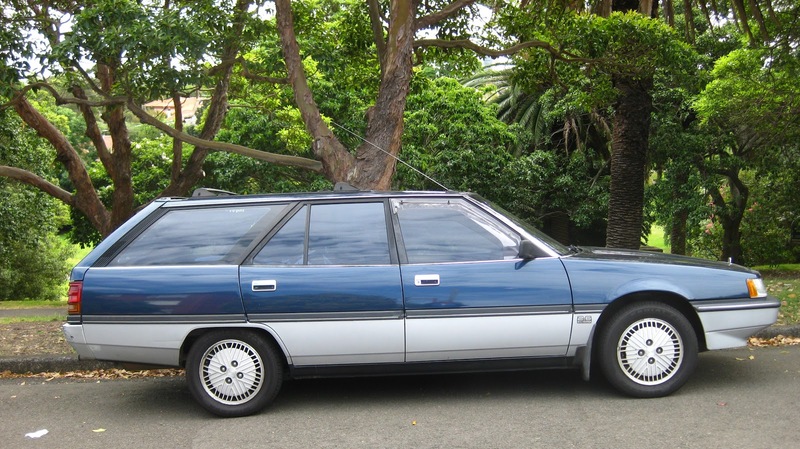 Minor note: NZ only got the TM/N/P Magna in wagon form, no sedans (although I’ve seen a few privately-imported Magna sedans of that vintage). My lasting TM/N/P Magna wagon memory is of t-boning one in 2003 when it pulled out of a side street in front of me. It was surprisingly undamaged but my company car Nissan Pulsar wagon was left undriveable. As Bryce notes, the Magna and Sigma were notorious for gearbox failures, yet they still sold well, and the V3000 was a huge hit. A friend of mine just messaged me to correct me on that a few minutes before you commented, and also to advise the V3000 was based on the JDM Galant Duke V3000 which is slightly different from the US market Sigma. I’ve edited it. Thanks! Good lord, so many Galant derivatives! I wish I knew more about the NZ car market… Any good websites you would recommend? Scott knows the NZ new market quite well, but Aussie cars here dont always match the Australian market versions trim levels here were higher to justify the extra cost. The blue Galant Duke/V3000 pictured does look quite a bit like the US Sigma, though. The headlamp and grille shapes are identical, though the grille insert appears different. I’m a big fan of this wagon’s shape. Not a fan of two-tone paintjobs though. Nice writeup William. a question I always mean to ask, and have finally remembered to do so: does anyone know of any footage of a Japanese factory applying a two-tone paint job? It occurs to me as being something very difficult to get right (and the join isn’t always hidden by trim either) and yet the Japanese have been doing this for ages now. Mitsubishi has an interesting history in the US market, but I don’t think they necessarily deserve their also-ran status as your article shows quite nicely. Perhaps if they’d not been sold as Chrysler Co cars for so long, their history would’ve been different. They were bigger than Honda in the home market until the mid ’80s or early ’90s IIRC. 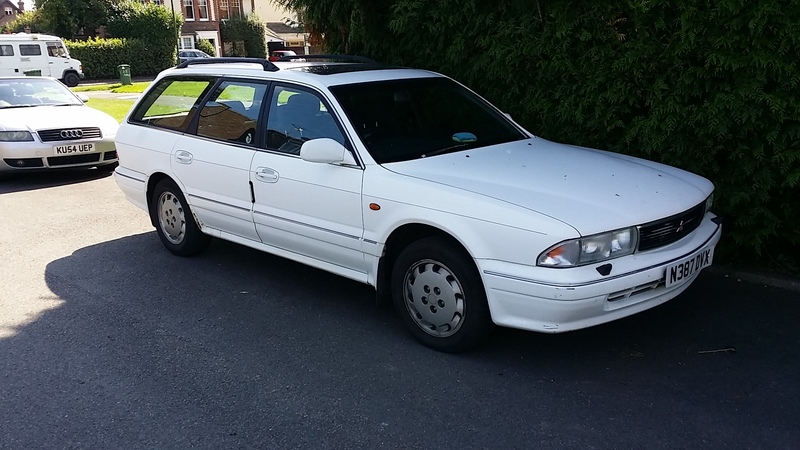 My family owned a ’94 Galant and its powertrain was better than an 4-cyl, automatic Accord or Camry of the same vintage, IMO; quite a sharp looking design with a .29 drag coefficient, too; we rarely saw any others on the road. A huge problem was a lack of market exposure. Even in the late ’80s, they were only selling cars on the coasts. Was the US market Galant Sigma also a wide-body design? I really can barely tell that the Magna is any wider than the car we got in the US. The 84-88 Galant/Galant Sigma as sold in the US really demonstrates why aping the Europeans was a good strategy; it’s gadget-crazed specification seemed like a rather tawdry and dishonest presentation of prestige. Even the Maxima didn’t go that far. By contrast, a more modestly equipped Galant wagon like the Magna would’ve been a good fit for the US market at the time. Too bad about all the intentionally-generic Colts being sold at the same time. I think the ultragadget spec was more a reflection of Japanese tastes at the time than a poor attempt to convey luxury. I like it, though in hindsight it has that rosy-retro glow that clearly wouldn’t have applied at the time. Pretty sure the US Sigma was the same narrow-body as the JDM Galant. 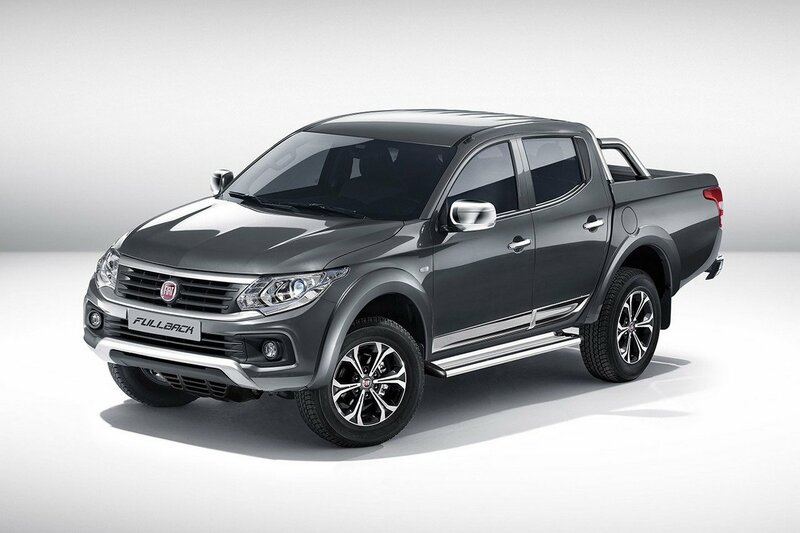 Look, the brand new Fiat Fullback. In which we all recognize a rebadged …. ? Very interesting Johannes – I didn’t know Fiat were rebadging this. The front end’s a little less challenging than the Mitsi original, so I guess that’s good…! Never seen one in the metal, but from the side, it looks like a giant Citroën BX Break. Without the suspension of course. I believe throughout the 1980s and into the 90s, Mitsubishi produced the best looking cars and trucks. By the mid 90s to today, Mitsubishi went downhill in terms of styling and appearance. Today’s Mitsubishi cars are among the most hideous I’ve ever seen. I had a 1989 Magna Elite TP 2.6 litre motor, two tone marine Blue. It was a great car, I had it for 16.5 years. i miss her, If I had the opportunity i would get another one. never had any problems with her.